It’s been a while. May has been a busy month for my mom and I, we haven’t been able to post as often as we’d like. Still, today I want to share my review of this cute facial mist from Tonymoly. 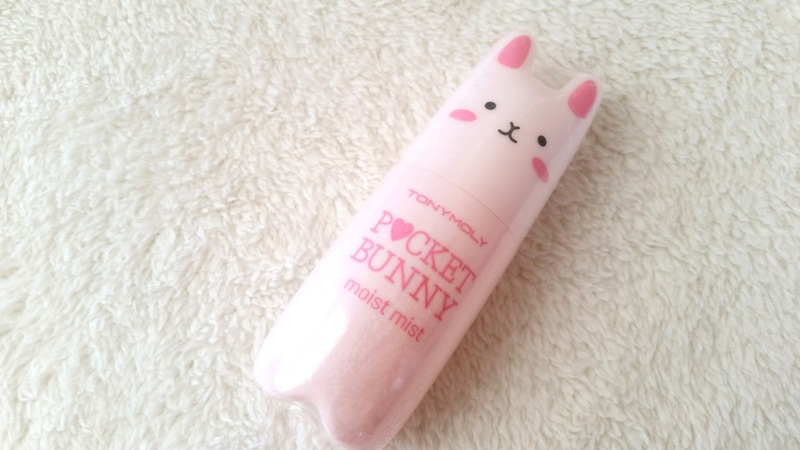 This is the Tonymoly Pocket Bunny Moist Mist. 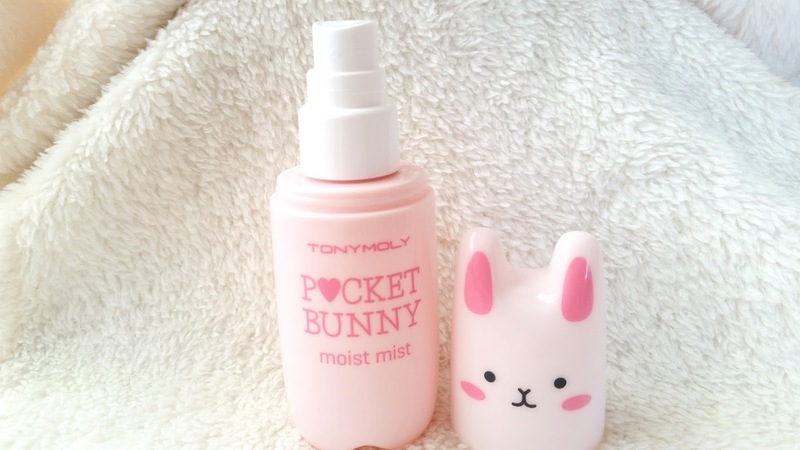 Tonymoly’s Pocket Bunny facial mist line has 2 types of mists. Aside from the Moist Mist, there’s also the Sleek Mist. The Moist Mist is a moisturizing mist while the Sleek Mist works to control sebum. I would have bought both mists to try, as that was my intent. However, after stopping by a local beauty shop and trying both mists on the back of my hands, I found that I couldn’t stand the scent of the Sleek Mist at all. I also wasn’t fond of the fact that both mists have alcohol as one of the first 5 ingredients in their ingredient lists. Still, I couldn’t resist their adorable packaging. So when I made my order online I only purchased the Moist Mist, hoping it won’t disappoint. Read on to see if it does or not! Product Description: An adorably packaged facial mist that can be used before and after makeup. It’s formulated with various fruit extracts and aloe to bring a boost of moisture to the skin. The mist is easy to use and it has a fruity scent. To Use: Close the eyes, hold the mist about 10 inches (20 to 30 cms) away from the face, and spray 2 to 3 times (more if needed). 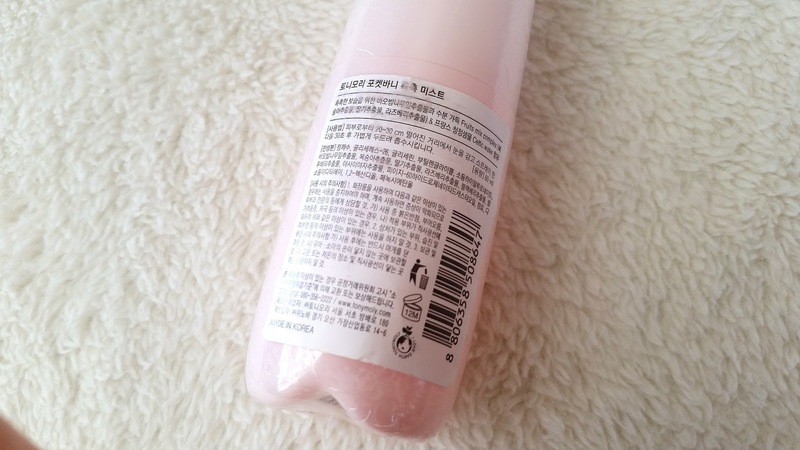 Ingredients: Water, alcohol denat., glycerin, butylene glycol, glycereth-26, dipropylene glycol, PEG/PPG-17/6 copolymer, phenoxyethanol, PEG-60 hydrogenated castor oil, methylparaben, arginine, fragrance, carbomer, disodium EDTA, sodium polyacrylate, propylene glycol, PVM/MA copolymer, propylparaben, aloe barbadensis leaf extract, fragaria chiloensis (strawberry) fruit extract, prunus persica (peach) fruit extract, pyrus malus (apple) fruit extract, actinidia chinensis (kiwi) fruit extract, ananas sativus (pineapple) fruit extract, vitis vinifera (grape) fruit extract, vaccinium macrocarpon (cranberry) fruit extract, rubus idaeus (raspberry) fruit extract, vaccinium angustifolium (blueberry) fruit extract, rubus fruticosus (blackberry) fruit extract, butylparaben, ethylparaben, isobutylparaben. Ingredients wise, this isn’t the best list I’ve seen for a mist. Sure there are tons of fruit extracts in this mist, but they are all on the bottom of the ingredient list. It makes me wonder just how much or how little of each fruit extract the mist actually contains. Still, having some is better than having none I suppose. The main issue I have with this ingredient list is the alcohol. It’s second on the ingredient list, which means there’s a fair bit of it. There’s a lot of talk on whether alcohol is really bad for the skin and I’ve shared my thoughts on it before, so I won’t get into it. However, I know personally my sensitive skin can be picky with products with alcohol in them. Not every product with alcohol causes irritation for my skin, but for the most part products with alcohol as one of the first 3 ingredients have a higher chance of irritating my skin than those that doesn’t. The Moist Mist is one of the few that didn’t irritate my skin, despite its alcohol ingredient. Still I was ever so cautious when I tested it and I only use it on some days. I will make a note, for those who care, that there are 5 parabens in the ingredient list as well. I haven’t taken my stand on parabens but I’ve read a fair share of them from both sides of the debate. I thought I’d point it out, just in case. Packaging: I admit, packaging was what almost sold me on this mist. I’ve wanted it forever due to its adorable packaging but I couldn’t bring myself to buy it because the packaging was all I wanted. Then when I stopped by one of my local beauty shops and saw it first hand, I realized the mist nozzle can be twisted off. This meant I can refill the bottle with any mist I wanted, that sold me. 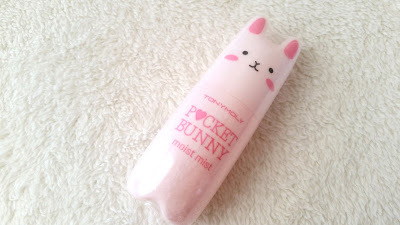 Like its name suggest, the Pocket Bunny mist comes in a cute bunny shaped container. It’s light pink in color. 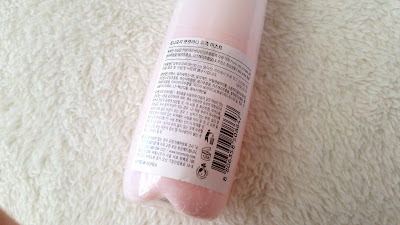 The container has little information about the product, although the outer wrapper has a white label with more information. As mentioned before, the spray nozzle is a twist-off and can be removed to fill the container. The spray top doesn’t spray the finest mist, but it’s still pretty decent. The manufacturing date can be found on the bottom of the product. Scent: Fruity, peachy scent with just a hint of alcohol is how I’d describe the scent. The alcohol scent is hard to pick up but it’s there. It’s especially noticeable if you twist-off the spray nozzle and sniff inside. The good thing is that when you spray the mist, the alcohol scent is not really strong at all. Actually, when you spray the mist, the most notable scent is a fruity scent that leans more peach. Fragrance is also added to this mist, but I don’t mind it much as it covers the alcohol scent nicely. Texture: The mist has the same texture as water. Michelle’s Thoughts: I had my worries about this mist before it even landed in my hands. By now you can probably guess why that might be but in case you missed it somehow, I was worried about 1 particular ingredient. Alcohol. It’s second on the list and from past experiences products with alcohol as one of the top 3 ingredients can often cause irritations for my sensitive skin. However, as you’ve read, the liquid inside the bottle wasn’t the real reason why I bought the mist. Ha. Still I was going to try it regardless. Why waste, right? When the mist finally arrived after its long journey overseas, I put it through a rigorous patch test. I had to be careful and I had good reasons. However, to my surprise, the mist didn’t irritate my skin at all. I wonder how much water there is in this mist, since the only ingredient before alcohol on the list is water and that could have majorly dilated the alcohol potency. Whatever the case, I was glad to find that the mist itself doesn’t irritate my skin. This meant that I could actually use it all before I refill the bottle with one of my favorite mists. This brings me to the next worry I had of this mist. Ha, this mist sounds like nothing but worries huh? It’s really not though. The reason why I finally decided to buy the mist was the twist off nozzle because it meant that I can refill the mist later on. Although, I had tried the mist in store, by the time I was making my order online I had forgotten whether the spray top sprayed fine mists or not. So I took a gamble hoping that it would turn out to be okay. Having tested 2 other mists that didn’t work for me in between the time of me making my order to the day my order arrived, I was getting worrisome about my bunny mist. Luckily, the spray top turned out better than expected. It’s not the best spray top but comparable to Innisfree’s, which is good enough for me. This is not my favorite mist but it’s a decent mist in my opinion. The ingredient list is a bit lacking, I’m not a big fan of the alcohol, and the fragrance can be strong for some people (although it’s okay with me). The mist is moisturizing and feels a bit cooling as well. It can be used before and after makeup. Although, I found that if I use it after makeup sometimes I have to touch up a bit with my cushion as well. I like to use this mist before my makeup, as it adds moisture to my skin and allows my primer and BB cushions to sit better on my skin. 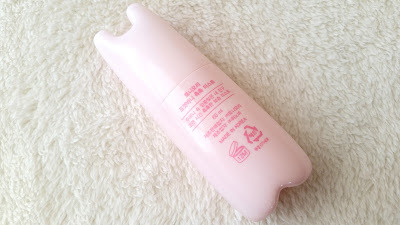 This is a mist that does its job and has a cute packaging to boost. It’s worth it in my opinion and I don’t regret getting it. 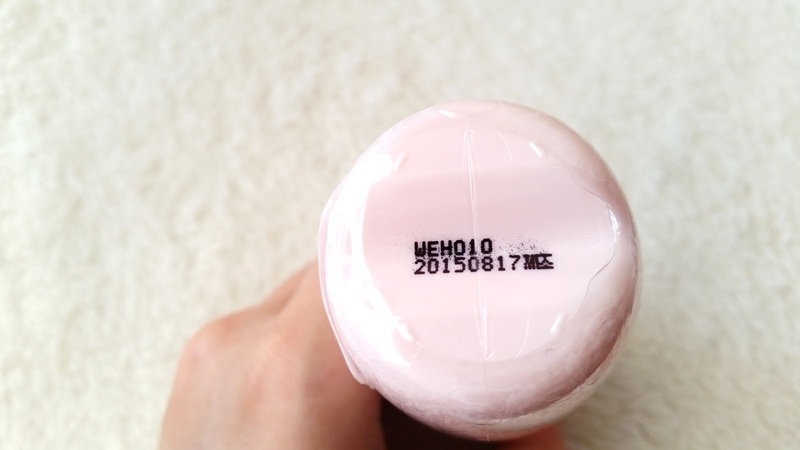 Manufacturing date can be found on the bottom of the product. Final Thoughts: Although I don’t regret getting this mist, I wouldn’t say this is the best mist ever. It was worth well to get it once but I don’t think I’d repurchase. This is a decent mist and it does its job. However, for people sensitive to alcohol or fragrances it might be good to try this out in store before buying it. Would I repurchase it in the future? Probably not. I purchased the mist for its cute container and while the facial mist is decent, it’s not worth well for me to get it again. Do I think this facial mist is worth a try? Well, that depends. Is your aim is the adorable packaging or an awesome facial mist? If you want an awesome facial mist that offers more skincare properties than just moisturizing, then I suggest you look elsewhere. There are a lot of good mists on the market that offers a lot more than expected. If the packaging is what attracted you like it did me and you aren’t sensitive to any of its ingredients, then give it a try. It is definitely cute and you can always refill it with your favorite mist later on.